The Site of Palmyra consists of the ruins of a caravan-oasis that further developed under Roman rule. After the Romans conquered Syria in the mid-first century AD, Palmyra flourished because of its location on a major trade route and became known as city of palm-trees. Emperor Caracalla declared it a Roman colony, which made it a luxurious one: new constructions, streets, arches, temples and statues were built, making Palmyra one of the greatest cities of Roman empire. Due to reports on its splendour by travellers in the 17th and 18th centuries, Palmyra also exerted a decisive influence on the evolution of neoclassical architecture. Lonely Planet talks of Syria and Jordan’s “Unflattering media profile” as putting off tourists. I can’t see how that can apply to Jordan but it is certainly the case with Syria. In fact we found the country very pleasant to travel round in 1999 – hopefully more recent events in a neighbouring country won’t have altered this! The trip had many highlights some of which are described in my reviews of the 3 other WHS. (In fact Syria also has 15 Tentative List sites - many of which in my opinion fully justify inscription). I hesitate to state that the ruined desert city of Palmyra is the best, since the others are very good too, but it certainly merits a visit by anyone who enjoys atmospheric historical sites. The journey to it across the desert sets the scene whether you come from East or West - its earlier name was Tadmor meaning “City of Dates” and both its old and new titles seem fully justified as you reach the oasis with its large palm groves. The city was Roman in the sense that it reached its peak when the area was part of the Roman Empire. However the colony had a degree of independence as a buffer state between Rome and Persia and had its own monarch. One of these, a Queen Zenobia, rather unwisely declared independence and finished up being carted off to Rome in chains. She is the “romantic figure” which Palmyra plays heavily upon (with hotels, restaurants etc named after her!). I don’t know if Hollywood has portrayed her but one can imagine the result! In fact the site doesn’t need any extra hype. A viewpoint from a hill fort a few miles away is well worth getting to both before (to show you what you are going to see!) and after (to remind you and put it all in context!) your visit – a large city is spread out beneath you with column lined roads still clearly visible. A number of major buildings remain in a reasonable state of preservation including a fine Temple of Bel (Baal). The city is well worth a half day wander (and wonder). Damaged in War since WWII: Syrian Civil War "Imagery analysis has revealed how the site and its surrounding area - including its Roman theatre - have suffered from the effects of shelling, activity by snipers as well as the presence of rocket launchers and tanks. There are also persistent reports of looting." New roads can be seen across the northern area of the site as well excavated fortifications (pink arrows), providing cover for military vehicles (yellow arrows). 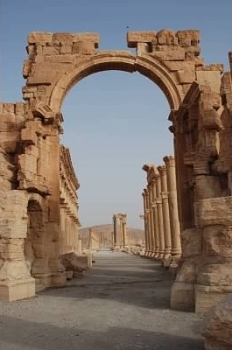 Under control of ISIS: On 21 May 2015, some artifacts were removed from the Palmyra museum by the Syrian curators and transported in 2 trucks to Damascus. ... The same day, ISIL forces entered the World Heritage Site (wiki) - On 27 March 2016 the site was recaptured by Syrian government troops. Women Explorers: Reached by Lady Hester Stanhope in 1812. She later claimed to have been crowned "Queen of Palmyra" under the Triumphal Arch! Multilingual inscriptions: The Temple of Baal Shamin has a column from AD131 "In Greek and Palmyrene (Aramaic) that praises the Secretary of the city for his generosity during the visit of the "Divine Hadrian" and for footing the bill for the temple's construction" also "The inscriptions which remain are bilingual, in Aramaic and Greek; a few with Latin also survive but only from the later years of the city (As'ad and Delplace 2002)." Manichaeism: "Palmyra became ... the pivot of further Manichean missionary work in Roman Syria"
87 Community Members have visited.